Healthcare providers are now recognising patients as customers, tailoring their services to meet specific needs at each stage of the patient journey. mHealth apps are fast becoming one of the best tools for this type of personalised patient-centered care, empowering patients through providing relevant and easily accessible information. mHealth apps are an essential part of a broader healthcare ecosystem, with widespread adoption due to the demand for convenient, patient-centred care.Click To Tweet Research has highlighted the key core features patients expect from their mHealth apps to be efficiency, better access to information, integration with other channels, and the availability of person-to-person communication. As demand continues to increase, it is important to consider these 4 best practices for developing successful mHealth apps. Research has shown that patients prefer simple, straightforward and easy to use mHealth tools. McKinsey’s Digital Patient Survey found that highly innovative and ‘fancy’ apps were considered less important. Therefore, in the case of healthcare apps, a simplistic approach with a focus on usability is more beneficial. It is important to personalise and tailor an app’s user interface, functionality, and content to a specific target audience. Implementing app onboarding allows providers to segment their communications, delivering personalised content and customising the individual user’s experience. This optimises the user interface for each patient providing a relevant, consistent and positive user experience. To ensure adoption by the target audience, develop a proof-of-concept to showcase how the app would look and function. Data security and patient privacy concerns are significant barriers to the adoption of mHealth apps and technology. One way to ensure user security is to provide data protection at the app-level, such as login usernames and passwords. Another way to tackle these patient concerns is to create a mHealth app outside the electronic health record (EHR) system. For example, general health system apps, condition-specific apps, pregnancy and maternity apps, and wayfinding apps can all be developed outside an EHR system. It is important to collect insight into user experiences in the app through comments and ratings, providing a closed-loop feedback to administrators. Beyond this, inbuilt app analytics is an invaluable tool that can help administrators understand how users interact with their app. mHealth apps should be continuously tested and refined based on these user insights to ensure user satisfaction and engagement. It’s no secret that digital innovation has already begun to disrupt the health industry for the better. At Liquid State we see the social and economic value in improving patient engagement in hospitals through apps and integrated communications solutions. 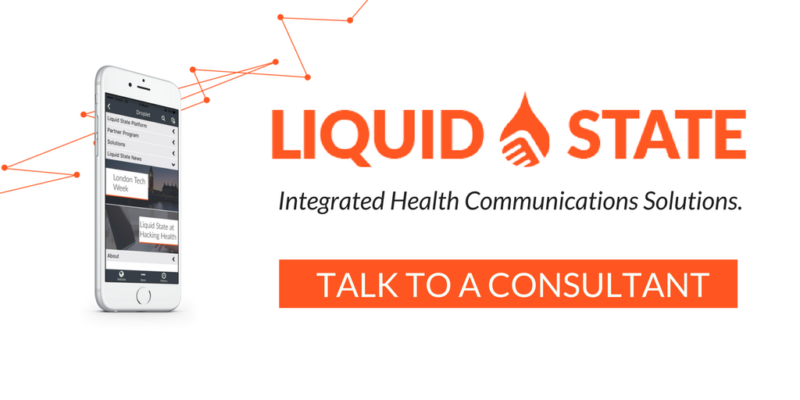 An integrated health communications solution built with the Liquid State Platform can transform your business across patient engagement, marketing, internal communications, reporting, and workplace health & safety. Liquid State takes mHealth apps to the next level, allowing healthcare professionals to deliver personalised, omnichannel, and searchable content directly to their audience’s device. Want to know what the Liquid State Platform can do for your Healthcare organisation? Get in touch with one of our consultants today.